Staff Photo by Dan Henry / The Chattanooga Times Free Press- 4/5/16. The Lookouts have extended the foul ball net to cover the dugouts at AT&T field. Whether during his 12-year playing career in major league baseball or in his current role as Chattanooga Lookouts manager, Doug Mientkiewicz always has been horrified at the sight of a rapidly traveling foul ball heading toward the crowd. "You try not to look at it, but as a player you are human," Mientkiewicz said. "You know when you've hit one, and you try not to look. They tell us to block everything out, but when you see someone in a big crowd go down and then see the emergency people move down, you feel about three inches tall. "There is nothing you could have done, but you feel really bad." The Chattanooga Lookouts will open their 70-game Southern League home schedule tonight at 6:15 against the Jackson Generals, and they will do so in a 17-year-old ball park that never has been safer. The protective netting behind home plate at AT&T Field recently was extended to the far end of each dugout. 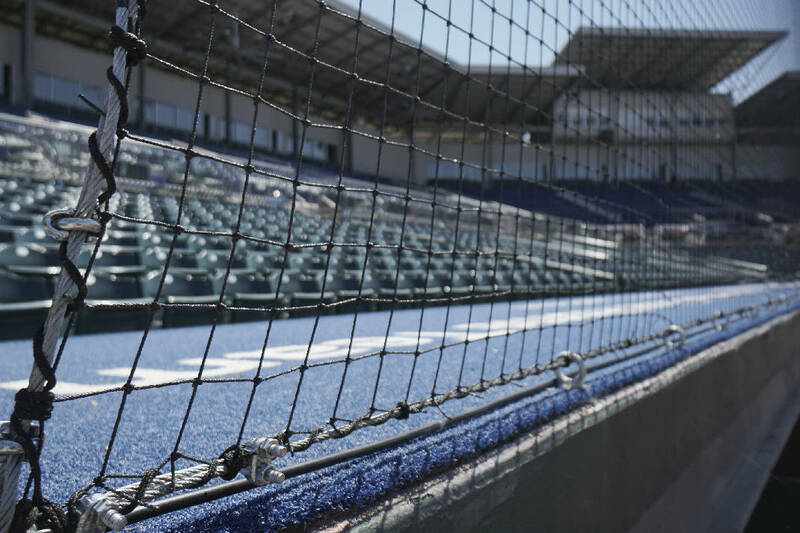 Netting has protected Lookouts fans in sections 108-111 and now will include sections 106-107 behind the first-base dugout as well as 112-113 behind the third-base dugout. "I think this has taken way too long to get here," said Lookouts starting pitcher Jason Wheeler, the MVP of last September's Southern League championship series. "We've seen a lot of people get hurt, and I know I've been in games where we've had to take a delay because a fan got hit by a foul ball. Everyone these days is looking at their phones, and I do that, too, so I'm not blaming people for doing that, but a lot of people don't understand how much this ball hurts. "A lot of people haven't played baseball at a high level, and the ball is coming at 100 miles per hour off a bat. They're not as focused as the players, and no one expects them to be, but they need to understand this ball hurts a lot, so the net is going to be a huge help." Major League Baseball commissioner Rob Manfred recommended in December that all big-league clubs extend the netting at their respective ballparks to 70 feet on each side of home plate. Minor League Baseball president and CEO Pat O'Conner quickly endorsed Manfred's recommendations. A Bloomberg News study in 2014 revealed that 1,750 fans are injured by foul balls annually at big-league games. Last season at AT&T Field, a child was struck in the face with a line drive in the stands behind first base and a woman was hit while in the park's beer garden on the third-base side. "It seems like it happens every game," Lookouts second baseman Levi Michael said. "A lot of times, the ball will find a way to hit a seat where no one is sitting, but every time a ball comes off the bat in foul territory, you hold your breath for a split second and hope for the best. "Whether it's me in the box or somebody else, it affects you the same. Your thoughts and sympathies go out, and you're distracted about something that shouldn't be an issue, because we should have been taking care of the fans long before this." The Lookouts issue warnings on game tickets about balls and bats entering the stands, and the danger is mentioned over AT&T Field's public-address system as well. The new netting will not protect fans sitting down the right-field line or in the left-field picnic area, but those spectators have more reaction time. "The fan interaction is going to change a little bit," Wheeler said. "Usually the first baseman or catcher ends the inning and will flip a ball to the fan over the dugout, so we'll have to see. They may flip it now to where the net ends, but in the long run this is something that is way overdue, and I'm glad it's here." Said Mientkiewicz: "The safety of the fans who built this game is what it's all about. I don't think we're too far away from moving it all the way down the line."